The EA allows creating a trading system based on a custom indicator. The trading robot automatically opens/closes trades by signals of the indicator that places the values not equal to 0 and EMPTY_VALUE to the buffer. The EA checks the values of the specified indicator buffers, as well as opens/closes and tracks deals according to specified parameters. closing all orders by a total profit value. 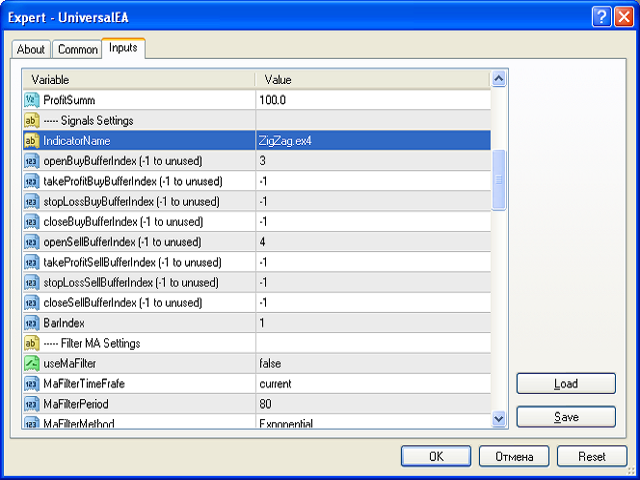 To implement your own indicator, enter its name and set applied buffers. The indicator should be placed in the standard folder. startLot - initial deal volume. maxLot - the maximum deal volume. MaxRisk - risk per deal, 0 - not used. pendingMinMax - place pending sell orders above the previous ones, and buy orders - below. This is AMAZING work. This is genius, both for the idea and implementation. I have been able to backtest a large numbers of indicator to assess which ones were the best suited for my market and strategy. Huge time and money saver. Thank you for this wonderful work. Starting off well for 2017 preparation. I will post more on my profile page to show the trading specifics but the Universal EA definitely does what it promises. I will add a comment with a jpg. - pendingMinMax - place pending sell orders above the previous ones, and buy orders - below. Added a signal for partial closing of deals. Added the TesterAutoTradeWeek parameter for the automatic validation of the EA on mql5. In testing mode, the EA automatically generates buy events 1 time per week. Added filter of trades based on the Moving Average. If the price is above MA, only Buy trades can be performed. If the price is below MA, only Sell trades are executed. -MaFilterPrice - prices of the Moving Average.